To Martindale or Not To Martindale? When I started my practice back in 1993, I paid for a real listing in Martindale-Hubbell (as opposed to the cheapie listing in the front blue plages) that I kept for four years. By 1997, I’d not gotten so much as a phone call from the listing. Looking forward, I realized that my website (that I developed myself and went live in late 1995) was already generating more visibility for me than the M-H listing – and so I declined to renew it. back-drop for lawyer interviews), but their days have to be numbered. 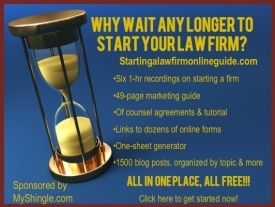 M-H does offer CD and online versions, as well as search through lawyers.com. All good information; but I haven’t used M-H in years. closed system used by Martindale-Hubbell doesn’t really work anymore. a colleague for a referral, checks the firm website, and Googles them. Perhaps you check Martindale, but it’s no longer the gold standard.